Cannot wait for another trip with your best friend or your family for their special occasions? Well, here is something that you can gift them - Gift Card by MakeMyTrip! Surprise your loved and dear ones with these Gift Cards, they can redeem it on flight, bus, train or hotel bookings or even homestays! There couldn’t be a better gift for someone who loves to explore new places, for people who live to travel, who are wanderers and adventurers and for people who would stop at nothing. 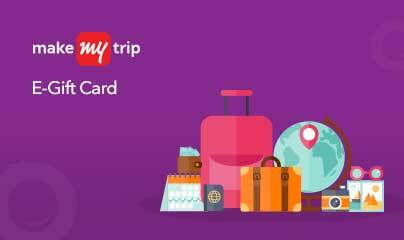 Get the most amazing vouchers, offers, deals and discounts for the Gift Cards and Vouchers by MakeMyTrip through GrabOn and save on the best deals out there. MakeMyTrip Gift Cards- For Many Occasions! MakeMyTrip (MMT) is an Indian online travel company that provides travel services including domestic and international flight tickets, rail tickets, bus tickets, holiday packages, hotel reservations etc. They operate through 51 retail stores across 47 cities in India, along with offices in New York. With multiple travel related apps for all types of cell phones, and impressive acquisitions like Luxury Tours and Travel PVT, MakeMyTrip is the country’s leading travel and logistics company. 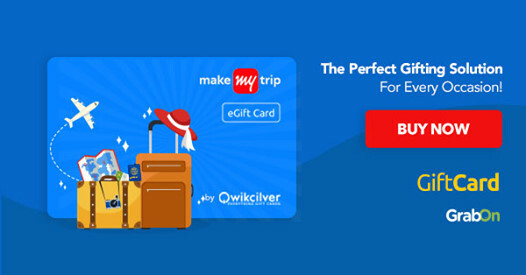 MakeMyTrip now offers Gift Cards to the customers which they can use to save on their travel expenses or gift it to their loved ones during festivals and other occasions. Be it a wedding gift, special occasions, auspicious events or recognition, a MMT e-gift voucher can open many doors to wonderlands! Picture yourself on a hammock, with a chilled drink in your hand, and backdrop of the sun setting on the beach. Beautiful, isn't it? What are you waiting for? Apply for leaves, mark the calendar and plan your travel accordingly. Whether you are a trekking junkie, mountain climber, party animal, beach lover, art enthusiast or just someone who could use a break from the everyday monotony, e-gift card is perfect for you. Travel to far away places and put all the pressure behind you. There couldn't be a better gift for someone who loves to travel than having another opportunity to explore more places. If you have someone important in your life who loves to travel, believe us, there can never be a better thing to gift him or her other than a MMT gift voucher. They can redeem their gift vouchers on their next travel booking. Your traveler buddy will definitely love your sweet and considerate gift. Get used to being the boss of gift giving, because from now on, you shall be know as that! With Makemytrip Gift Cards, you can redeem the denomination on any booking. It is the best gift to give someone who is looking forward to a good vacation. A friend planning a low budget trip to Goa with friends or a newly-wed couple planning a luxurious honeymoon to Paris, an e-gift card from MMT can be redeemed by all. Find all your travel needs brought together under one platform and save on each part of your vacation. Whatever be the occasion, surprise your friends and family with the Makemytrip Gift Voucher and Gift Cards. Apart from Makemytrip Gift Cards and Vouchers, you can avail the latest and the hottest handpicked deals from Makemytrip only on GrabOn. Flights, buses, hotel and accommodations, MakeMyTrip offers a lot of services to its customers and you can avail big discounts on all of these services. Discover new, exciting and verified coupon codes for travel. Save on your business trips, college reunions, annual travel home or any sort of travel expenses in general. Take a truly stress-free vacation while we take care of the expenses and help you save big on your travel expenditure. Enjoy your dream vacation with MakeMyTrip and Happy gifting with GrabOn Make My Trip Gift Vouchers. Avail the mmt gift card offer and save more on your purchase. Tell me more about the MakeMyTrip Gift Cards? The MakeMyTrip e-gift card can be used like your debit card ( with limited featured of course), you can simply book away at the MMT site. Or just send your wishes in the form of a gift card to your close friend or family, give them a chance to go away on a weekend getaway or a holiday trip. What is the use of a MakeMyTrip gift voucher or card? 1. What are the steps involved in purchasing my gift card? Select from a list of available Gift Card denominations. Finally, proceed to check out and make the payment. You can pay via credit card/ debit card/ Net- banking. The MakeMyTrip gift card will be sent to the respected recipient once your payment transaction is complete. 2. What types of MMT Gift Cards or Vouchers are available and what is their validity? There are only MMT e-gift cards and vouchers available. Please refer to the terms and conditions to know the validity of your gift card. 3. How can I redeem my MakeMyTrip gift card or how can I use my MakeMyTrip gift voucher? 4. Can I use my gift card or voucher on the MMT mobile app and can multiple gift cards be used? 1. What do I do if the transaction fails but the amount gets deducted? 2. Can I use my MakeMyTrip gift card on other online stores?